Thanks to the fact that Edirol implemented rich MIDI control schemes on their mixer, you can make all the magic happen from your laptop. 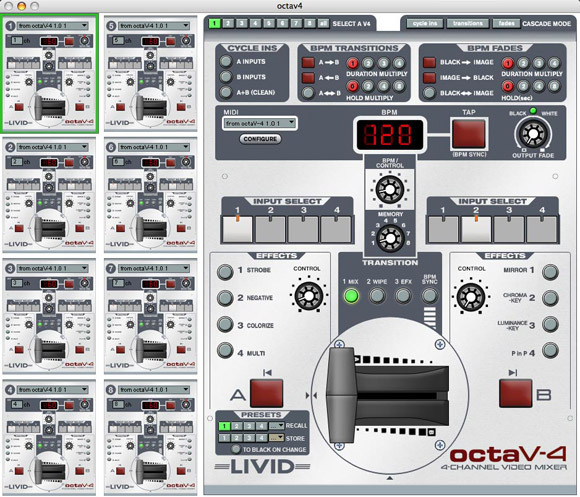 The octav-4 software provides a visual representation of 1-8 mixers on your computer, and allows you to “cascade” effects and transitions across all the mixers. You can automatically save presets, sync BPM transitions and fades, and automatically cycle inputs. This means, of course, two things. First, Livid is proving capable of doing cool things with the V-4 even Roland/Edirol missed. Second, you need to call all your VJ friends right now and wrangle your V-4s together. US$129, already shipping, and already in action with my NY mates Josh Goldberg and Giles Hendrix with Paul van Dyk @ The Roxy (who have the projectors, evidently).